PerformancePoint Services in Microsoft SharePoint Server 2010 enables you to create and use powerful dashboards. This includes a Balanced Scorecard. Financial perspective KPIs for productivity, revenue, growth, usage, and overall shareholder value. Customer perspective KPIs for customer acquisition, customer satisfaction rates, market share, and brand strength. Internal perspective KPIs for resource usage, inventory turnover rates, order fulfillment, and quality control. Learning and growth perspective KPIs for employee retention, employee satisfaction, and employee training and development. This example was created by using PerformancePoint Services. The articles in this section describe how to create a similar Balanced Scorecard that you can use in your organization. Identify the KPIs that you want to use. Make a list of those KPIs and the data sources that you must have to create them. For the example Balanced Scorecard, we use a SQL Server Analysis Services cube, a table that is stored in SQL Server, and several fixed values that we enter manually to create the KPIs. Create a scorecard that includes KPIs across the financial, customer, internal, and learning and growth perspectives. To create a scorecard that resembles the example, see Create a scorecard for a Balanced Scorecard by using Dashboard Designer. Create a strategy map that uses a Microsoft Visio diagram to represent the four perspectives described earlier in this article. 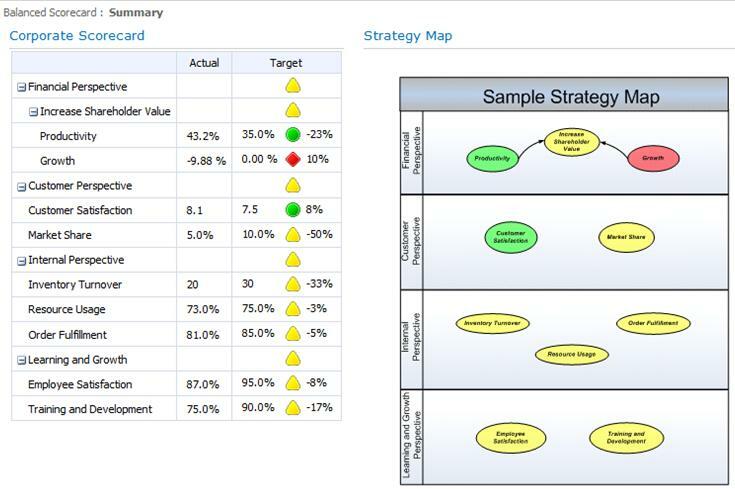 To create a strategy map that resembles the example, see Create and configure a strategy map as part of a Balanced Scorecard that you create by using Dashboard Designer. Add the scorecard and strategy map to a dashboard page, and publish it to SharePoint Server 2010. For more information, see Assemble and publish a Balanced Scorecard by using Dashboard Designer. Before you begin, make sure that you open PerformancePoint Dashboard Designer. You can open Dashboard Designer by using the Business Intelligence Center. Open the Business Intelligence Center site in a Web browser. The Web site address (URL) to the Business Intelligence Center typically takes the form http://<ServerName>/sites/BICenter. If you do not know the location of the Business Intelligence Center site, contact a SharePoint administrator. In the Business Intelligence Center, click a section — for example, Monitor Key Performance, Build and Share Reports, or Create Dashboards. More information about each area is displayed in the center pane. In the center of the page, click a Start using PerformancePoint Services link. The PerformancePoint site template opens. After you have opened Dashboard Designer at least one time, you can open it from the Start menu on your computer. To do that, click Start, and then click All Programs. Locate SharePoint, and then click PerformancePoint Dashboard Designer. Alternatively, you can continue to open Dashboard Designer from the Business Intelligence Center. Before you begin to create items by using Dashboard Designer, make sure that you have at least Design permissions assigned to you in SharePoint Server. Also make sure that you have at least Read permissions to the data sources that you want to use for the Balanced Scorecard. For more information, contact a SharePoint administrator.